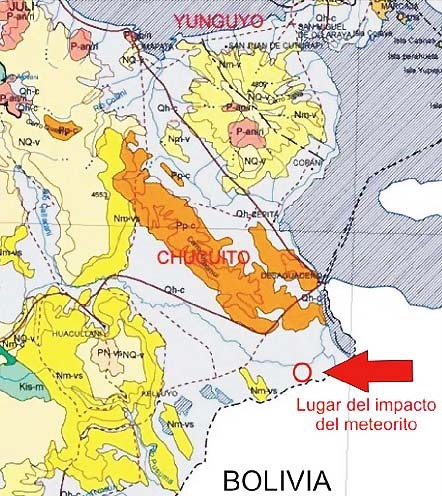 Red circle and arrow identify meteorite impact crater site in Carancas, Peru, south of Yunguyo at the southern end of Lake Titicaca. 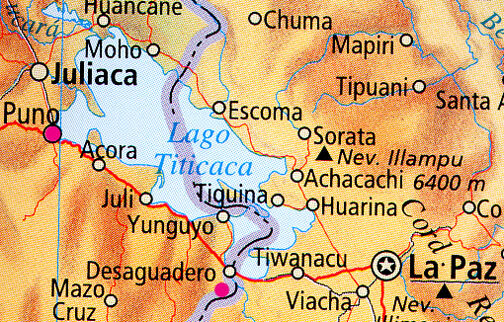 Map created by Jose Machare, Ingemmet. 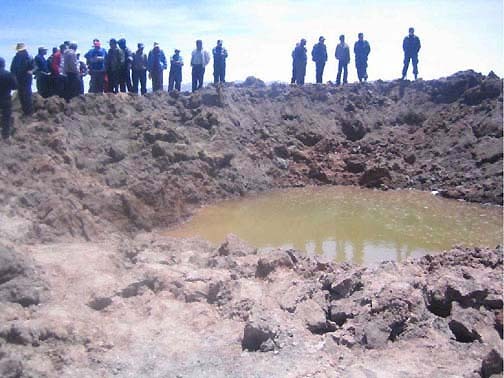 Meteorite crater filled with ground water after 11:34 AM impact on September 15, 2007, in Carancas, Peru, south of Lake Titicaca near Bolivian border. Hole diameter measured between 7.4 to 7.8 meters (26 feet). Ring boundary of ejecta around hole measured between 13.3 to 13.8 meters in diameter. Crater depth to groundwater estimated about 2 meters. September 26, 2007 Lima, Peru - It was 11:45 AM on Saturday, September 15, 2007, when alpaca farmer, Justina Limache, heard a “thunderous roar from the sky.” Scared, she grabbed her 8-year-old granddaughter and ran into her house. For the next few minutes, Justina heard rocks raining down on the roof so loudly that she worried her house would collapse. What 74-year-old Justina Limache did not know was that a meteorite had fallen near her Carancas, Peru, home 62 miles (100 kilometers) southeast of Puno and not far from Lake Titicaca. Carancas is a farm community of about 2,000 people who raise cows, alpacas, llamas and other animals on the high Andean plateau near the Bolivian border.